I’ve had a bunch of thoughts and photos that don’t really fit into a blog post, so I figured I’d just throw them all here. Mileage-wise, since leaving home July 27th, I have ridden my little XT250 a distance equal to riding from Los Angeles to Atlanta and back to Los Angeles, and then back to Atlanta again. It hasn’t complained yet. For those that think they need at least a 650cc motorcycle to do this trip, I still disagree. 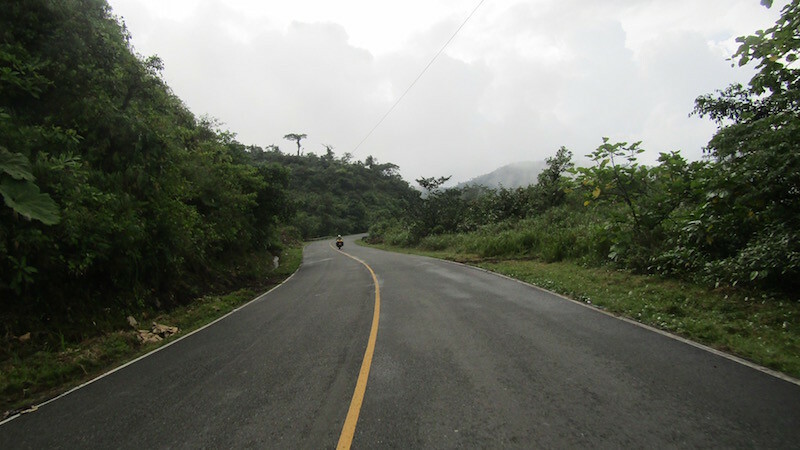 The speed limit on most highways in Central America is between 60 and 80 kmh, or 35 to 50 mph. In towns the speed limit is typically between 30 and 40 kmh, or 20 to 25 mph. You can do 100 kph on small stretches of the InterAmerican highway, but that’s about it. Most of the time, you will end up averaging about 35mph. Nearly every male between the age of 14 and 80 walking beside the road is carrying a machete. Those between 10 and 14 are holding a rope attached to a horse. Bare electrical wires attached to shower heads. Open-air construction. Most roofing material does not touch the walls; there is a four to six inch gap between. This allows for good air circulation, good mosquito circulation, and good critter circulation. 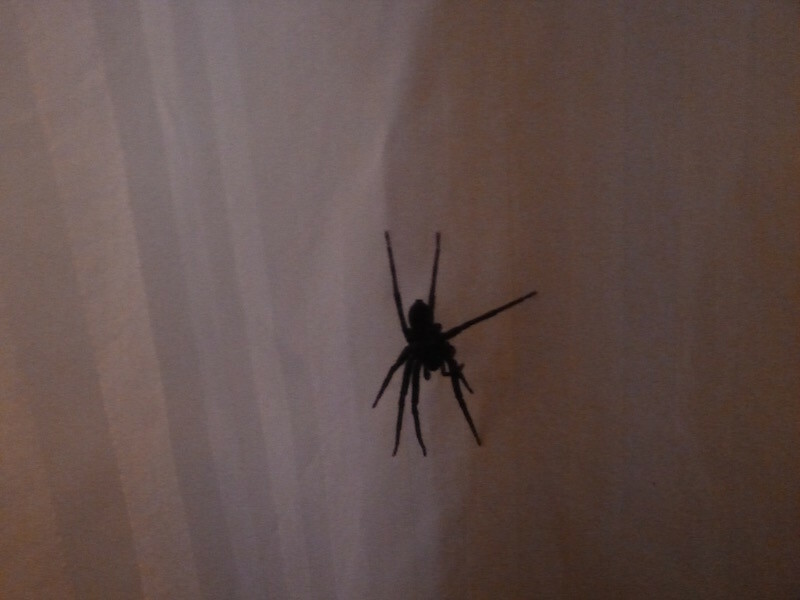 Spider on the inside of the shower curtain. Overall diameter (including legs): about six inches. To her credit, the water from the shower didn’t bother her and she stayed put. 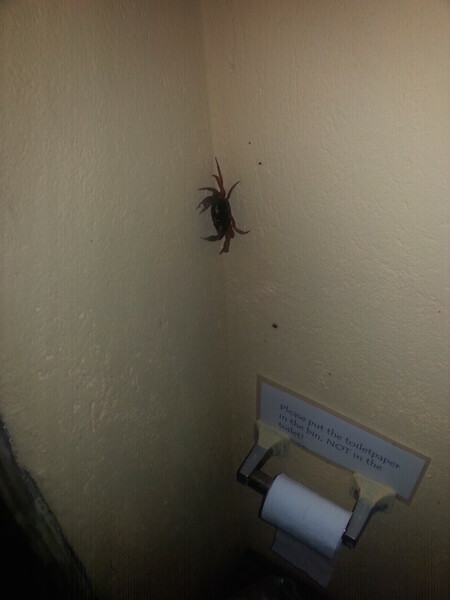 In the mountains, you get large spiders in the bathrooms. 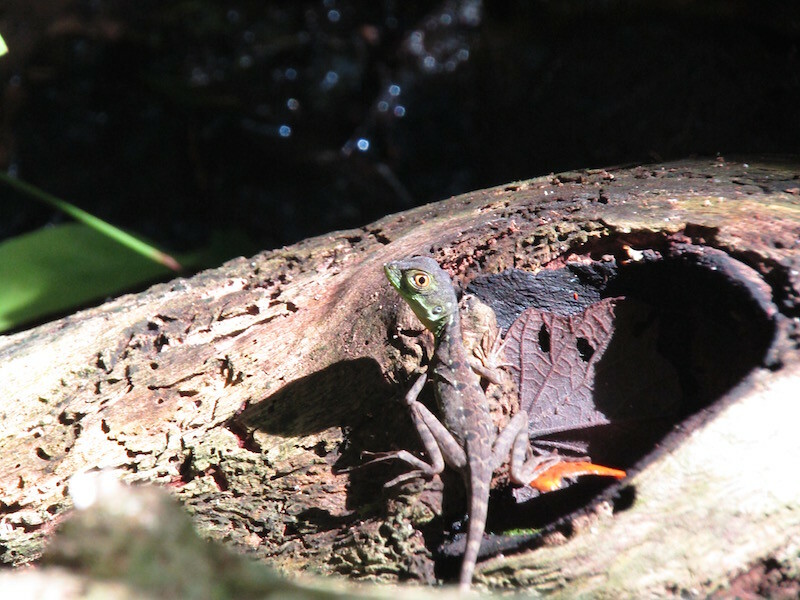 In the forests, you get large snakes, frogs, etc. 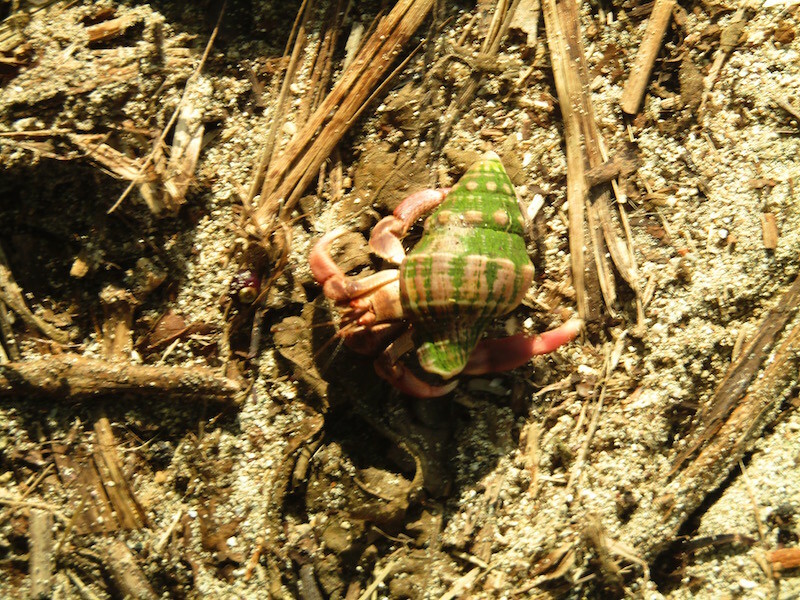 Along the coast you get large crabs. In my previous life, among other things, I spent time studying and discussing human factors — how humans interact with their environment, products and machinery. So things like this bathroom just drive me nuts. The entire room is three feet wide. I am just over six feet tall. I cannot sit on this toilet…my knees hit the wall long before then. Also, the only way to get to the shower is to squeeze between the toilet and the wall. 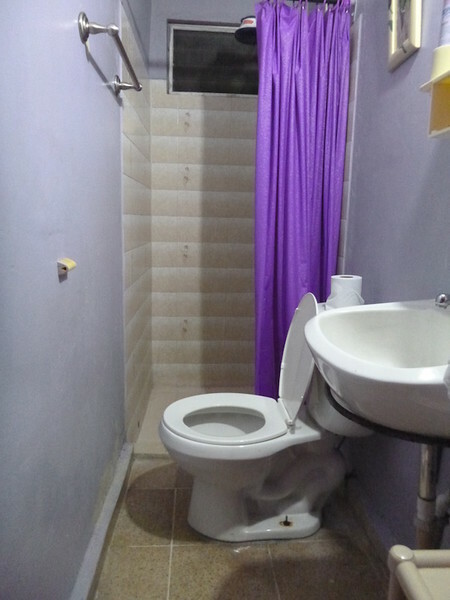 But that’s exactly where they put the towel rack, as an obstacle, instead of on the opposite wall above the toilet. That wall was reserved for a picture of a tulip. And if there’s a towel on the rack, you can’t sit on the toilet OR get to the shower. There used to be a toilet paper holder to block your path also, but apparently someone already broke that off getting to the shower. Random artwork in a hostel. In the morning I said goodbye to the beach and headed inland once more. Elli, the German host at Rancho Estero. She makes my little 250 look even smaller. Real story: Her boyfriend runs the hostel, but he’s on vacation right now, so she’s running two places. She owns the Surf & Shake surf shop in Santa Catalina. And she surfs. And she gives lessons. And she rides her bicycle out to the hostel and back with her surfboard under her arm. Pretty cool. After backtracking 60 miles up the peninsula to the InterAmerican Highway, it’s another 60 miles down the highway to the turnoff at Anton. Parts of this ride remind me of Highway 99 through the Central Valley of California. Divided four lane, lots of farms and ranches, big hills in the distance. It just has a similar feel. On the way it starts getting very dark ahead. It’s lunch time and looking like some serious rain is headed this way, so I pull off at a Chinese restaurant on the side of the highway. Big, nice place. Good food. And sure enough, it starts to really pour. Lightning. Thunder. Heavy rain. After an hour or so it lets up, and I’m back on the bike headed for Anton, my balding knobby tires performing better than expected for the conditions. The road from Anton up to El Valle de Anton, or Anton Valley, starts out with some potholes but turns to a nice two lane. It starts in jungle-like foliage, climbs through pine forest, then up to clear-cut. The last climb is sharp and steep, with some switchbacks I can only describe as “quirky”. Just as suddenly the road descends via similarly quirky, sharp switchbacks into Anton Valley, which is actually in the six kilometer wide crater of an inactive volcano at about two thousand feet elevation. 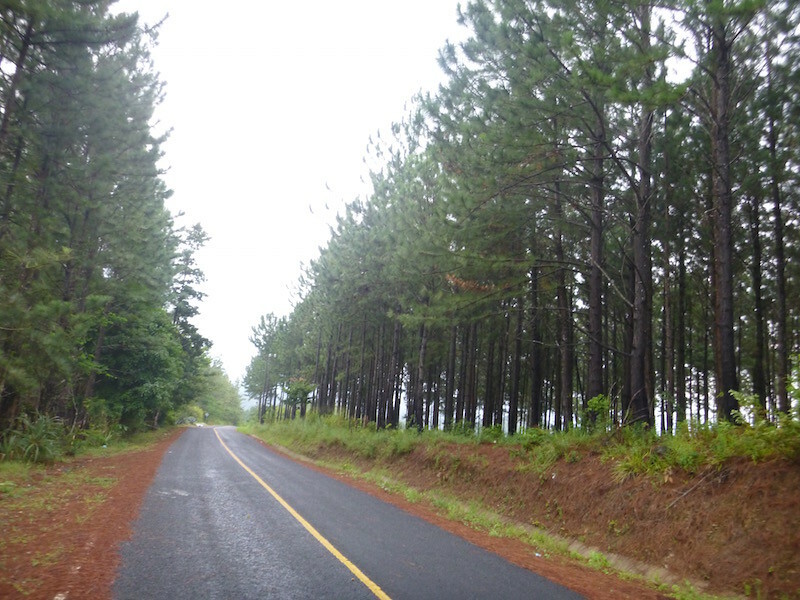 and turns to pine forest on the climb up, before cresting the rim of the crater and back down into tropical Anton Valley. This all happens in a matter of just a few miles. I’m staying at the Bodhi hostel, which opened about eleven months ago and is doing a good business based on the people I see wandering in and out. 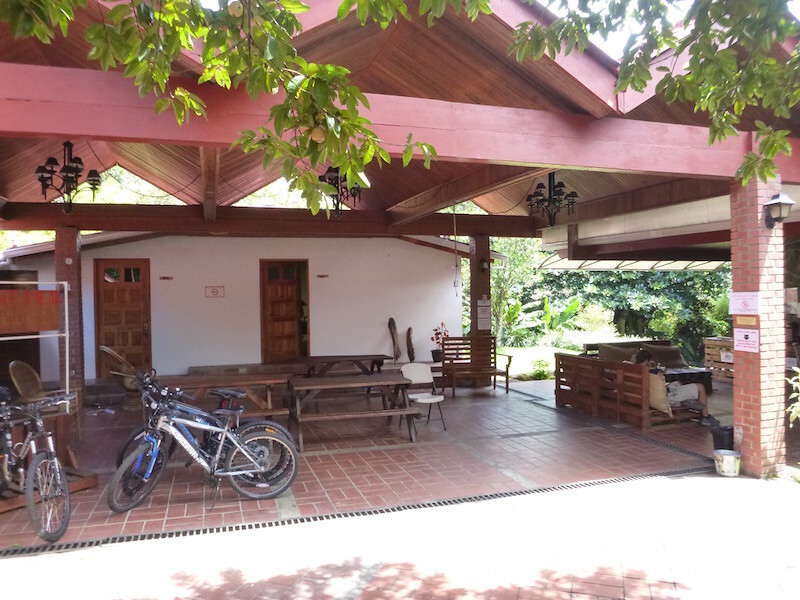 Definitely the backpacker crowd, but this place is great for motorcyclists as well as they have a large fenced and locked lot adjacent to the hostel, and directly across the street from the police station. Secure parking shouldn’t be a problem. The dormitory is huge and there are quite a few guests. I choose a private room with shared bath. The room is on the small side but comfortable. 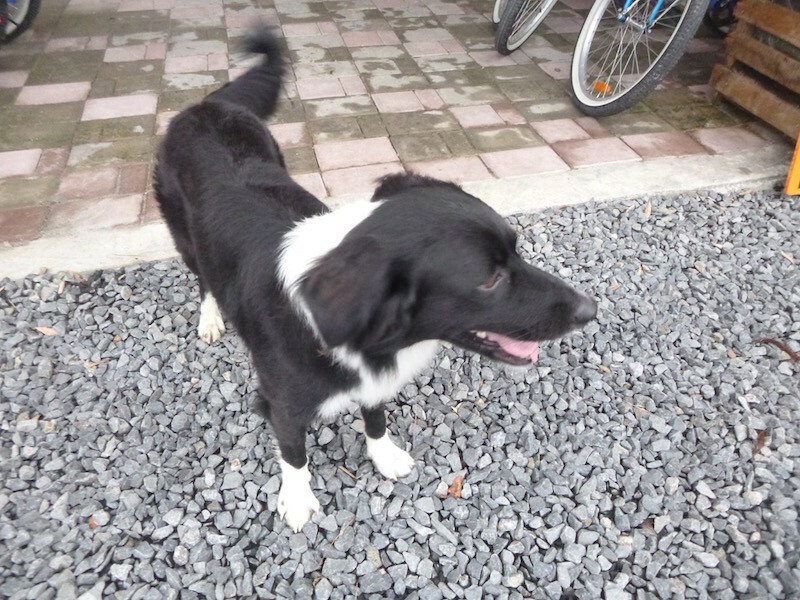 Oreo, the adopted hostel dog, greets me at the door. I’m told he’s a “mountain dog”; he has helped guide lost hikers off the mountain several times. Apparently he helped a hostel guest down from the mountain, and the hostel since adopted him. 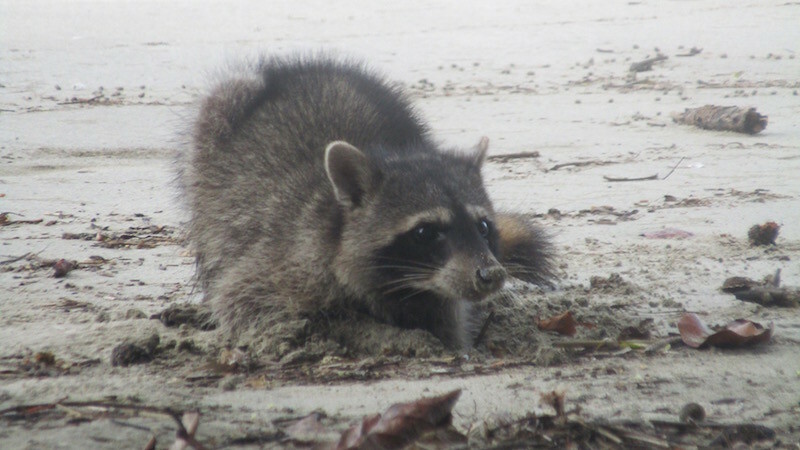 He’s still free-roaming, but he wanders back every night. This is Oreo. He walked ahead of me all the way (5 blocks or so) to a Peruvian restaurant (like he knew where I was going), sat under the table on the patio while I ate, sat outside the grocery store door while I shopped, then led me all the way back to the hostel. And never asked for a tip. He’s a pretty cool dog. Tomorrow is Panama City. I have a few days of projects, sight-seeing, and hopefully other things to do there. The weather won’t be as cool as here in Anton Valley, but I’m beginning to adjust to the heat and humidity of being this close to the equator. Or at least beginning to accept it. You don’t get to Santa Catalina by mistake. It’s not the kind of place you stumble upon while driving through on the way to somewhere else. 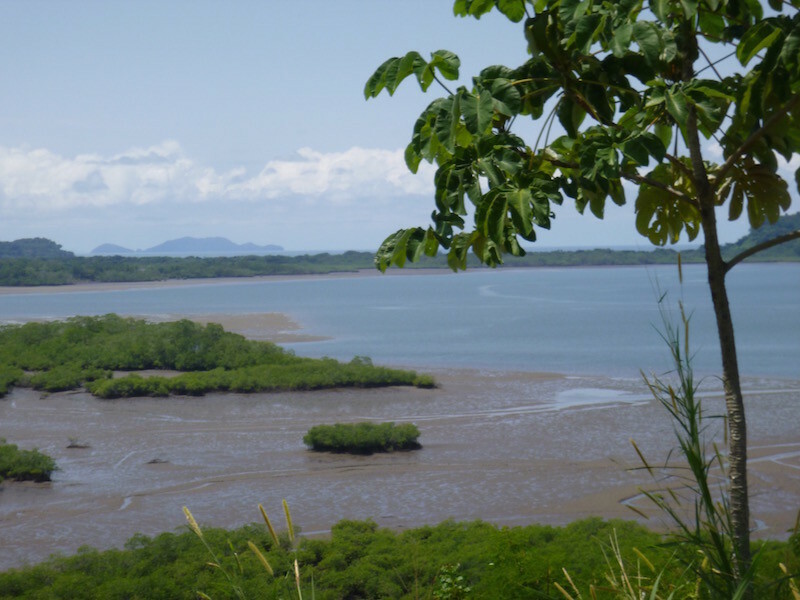 Santa Catalina is at the end of the road, about sixty miles down a road to nowhere else at the end of the Veraguas Peninsula. It’s mostly a small fishing village, but as with others along the Pacific coast of Central America, the surf has attracted a separate tourism industry. 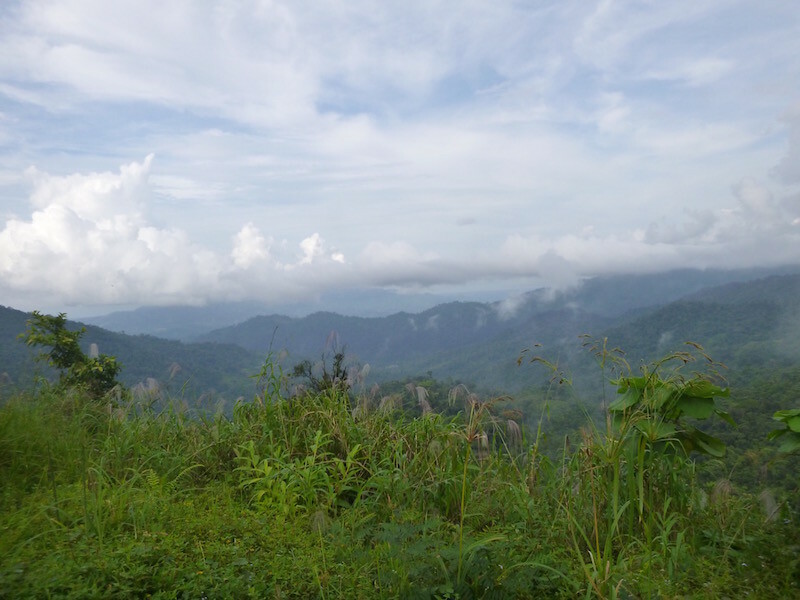 The ride down from David gets nice as soon as you turn off the InterAmerican Highway. The first sixty miles of InterAmerican Highway (I always called this the PanAmerican Highway, but it seems to have changed names somewhere along the way) are full of construction as they widen it from two lanes to a divided four lane road. After turning off at Tole, it’s mostly twisty road through the hills with glimpses of ocean. Far background is a large island; ocean between. There must be some serious fishing here, as I pass lots of places with large Grady White and Contender fishing boats with twin Yamaha outboards. Some have matching high-end homes, others are parked next to very meager houses. The boat is clearly worth more than everything else on the land. Somewhere about 15 miles before Sona, I ride through a swarm of wasps. The noise of them smacking my face shield and the sudden realization that I’ve been stung in the throat happen about the same time. I immediately think back to the last two times I’ve been stung by bees while riding, and start grabbing at my shirt and jacket to try to keep any that might have fallen down my shirt from stinging me. The pain continues through lunch in Sona (a great carne guisada, rice, beans, and a bottle of Coca Cola for $3.25), but begins to lessen by the time I reach Santa Catalina. It’s off-season now, and there are only two German women staying at the hostel at the moment (and it’s managed by another German woman — is there a secret Central America movement I don’t know about? Clearly this part of the world has some heavy word-of-mouth advertising in Germany). 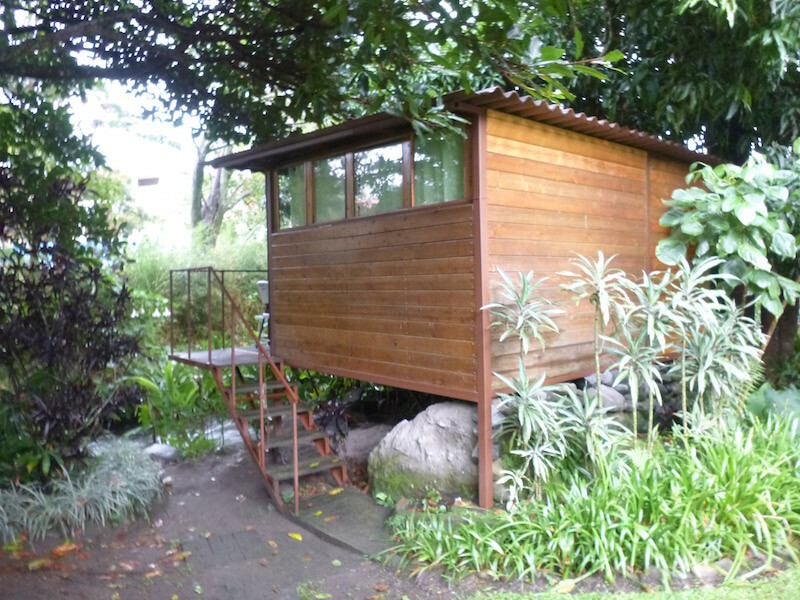 I have a private grass hut overlooking the beach with a shared bath. 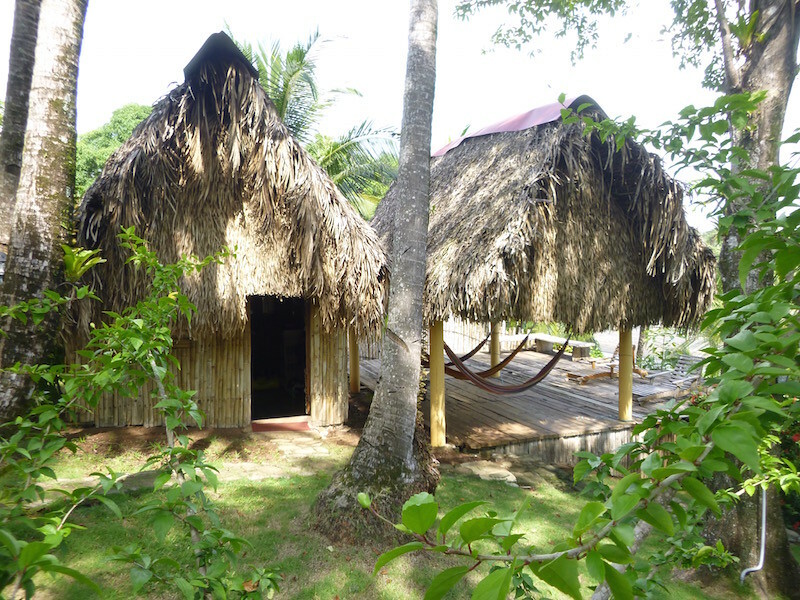 Hammocks hang just outside the door, and the ocean breeze helps to mitigate the humidity. Town and a fish dinner is an easy two kilometer ride. Otherwise, I don’t plan to move from the hammock for the next several hours. This morning I walked into Boquete and bought some oil, then stopped at a small car repair shop a block from where I was staying, and asked the owner if I could change my oil in his lot and leave my used oil with him. He not only said yes, but cut a one gallon plastic jug into a drain pan for me and showed me where I could pour my used oil into his recycle drum. Another very nice, helpful local that didn’t hesitate to help out a complete stranger. That seems to be a theme on this trip. While changing my oil, we got to talking a bit, and he asked where I had been. “Mexico? Guatemala? Very dangerous!” he said. I smiled and told him how friendly and beautiful those countries had been. It’s still funny to hear how the countries on either side of where I am presently are always dangerous, but not where I am. Now that I think about it, I’ve been hearing that since I was standing in Texas. It’s also interesting to hear the same theme from the owner of this auto repair business in small town Panama compared to another in Texas. Aside from the language difference, the story was the same: in slow economic times, people either extend their maintenance or do without. They try to go longer between oil changes, but don’t want to spend the extra money on quality oils that can survive the extended use, setting themselves up for trouble and greater expense all because they are trying to “save” money. This of course has affected his business and he is somewhat thankful for the ex-pats that have moved to town and add to his business. 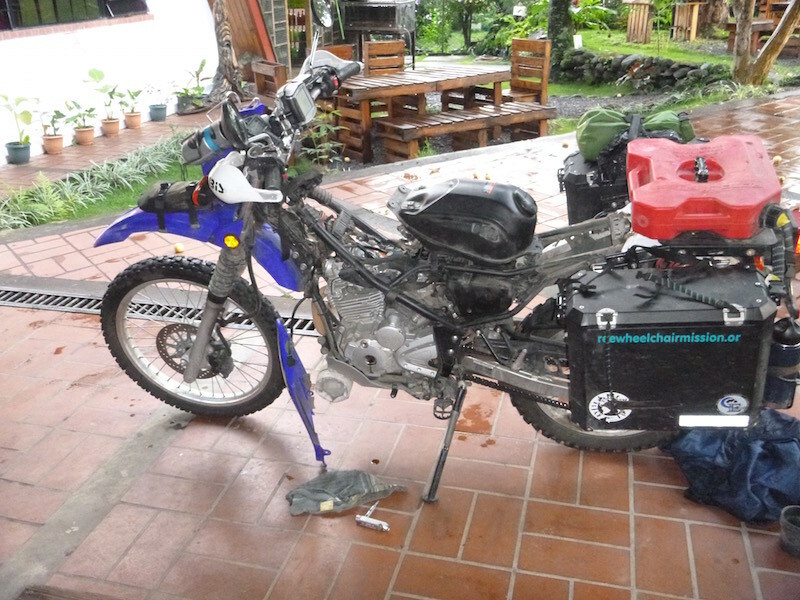 I came down from the Chiriqui Highlands of Boquete to David (pronounced Dah-Veed) to try to find tires for my bike before heading to Panama City. 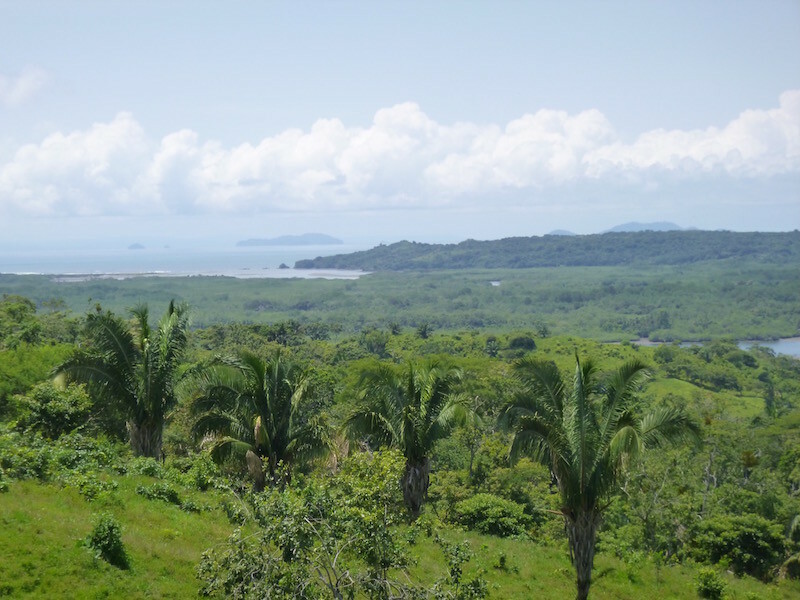 David is Panama’s second largest city, and is primarily in an agricultural lowland area. Many things were immediately noticeable: first, the humidity. Phew. Automatic diet plan: just sit and sweat it off. Second, within a block, I saw KFC, McDonalds, Pizza Hut, and even a Dairy Queen. This is generally not a good indicator of where I want to be. 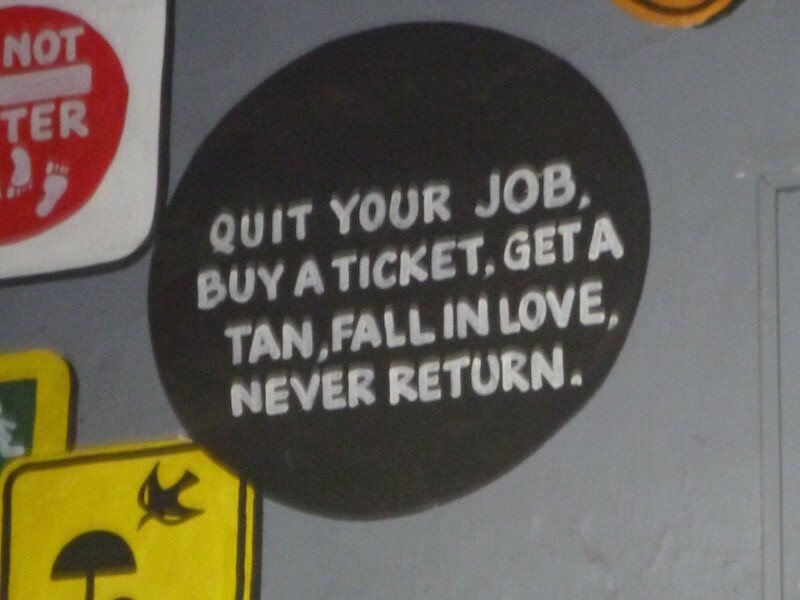 Third, I was quickly reminded of what I don’t like about Americans (okay, just certain ones), and hostels. The hostel shall remain nameless (but let’s just say, if you ever find yourself in David, don’t stay in any hostel named after a color). The American woman who owns and runs the hostel (I shall also leave her nameless) immediately began asking very inquisitive and I felt rather personal questions before I was even inside the gate. Then she warned me not to walk away from my motorcycle while it was outside of the gate, and once it was inside the gate, told me that my locked aluminum boxes on the bike were not safe and I needed to take anything of value out. (So, let’s see…it’s okay to walk four blocks to the grocery store and restaurant, but my stuff isn’t safe locked up inside your walled compound. Okay….). Uh, let’s see….the rental rate begins at 8pm. I can’t go into the room at 9pm because it’s still too hot. But I am told I don’t need it until after 10pm. Rather than respond and run the risk of more personal questions and observations about my sleeping habits, etc, I went back outside and continued to sweat in the driveway, wondering why I didn’t just ride the 25 miles back up the hill to Boquete where it was 69 degrees already. So, lesson learned. No more room rentals from American ex-pat former Peace Corps workers with attitude. Oh, and I never found tires either. But I have a good lead in Panama City now, so that’s at the top of my list. In the “Very Small World” category, as I was walking across a busy street in David this afternoon, way off the beaten tourist path, a guy on a motorcycle stopped to let me cross, and as I walked in front of him, he said “Hey, stranger”. 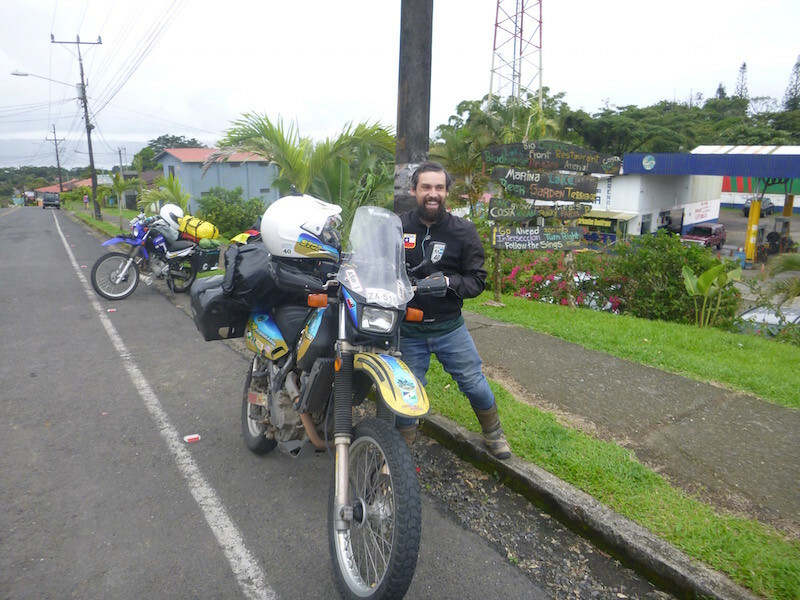 It was a guy from Oregon on a Kawasaki Ninja that I had met at the Nicaragua – Costa Rica border crossing. I’ve probably passed a couple of million people since then, criss-crossing from the Pacific to the Caribbean and back through two countries, and if I had been five seconds sooner or later, our paths would not have crossed again in David, Panama. Even off the Gringo Trail, it’s a small world. Boquete is a nice town in the Chiriqui Highlands, at about 4,000 feet elevation. There isn’t a lot going on in the town itself, but the area around Boquete is very scenic and has a nice feel to it. Because of the elevation, the temperatures tend to stay constant year-round, with an average high around 80 and a low in the mid 60s. 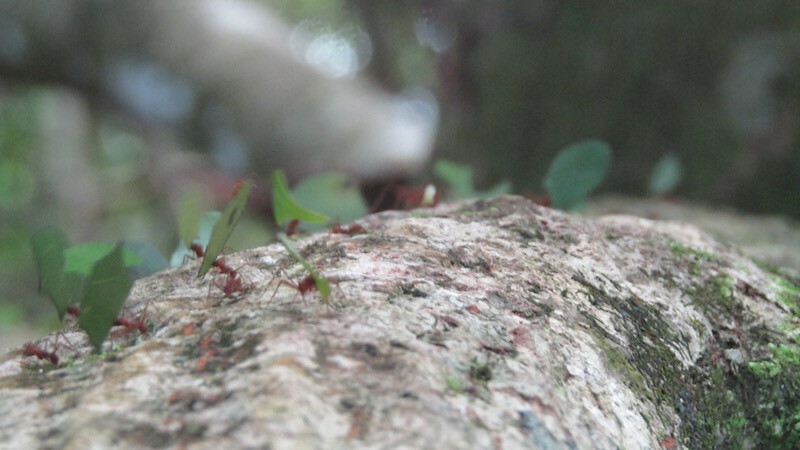 The climate is not only great for growing coffee, but for growing an ex-pat population as well. It seems that of the 25,000 or so residents of Boquete, nearly 25 percent are from North America or Europe. I walked down to the Sugar & Spice Bakery for breakfast, and the place was packed, And I think all but one family was from the United States originally, although most were now locals. The hostel here is very nice, very clean and well organized. 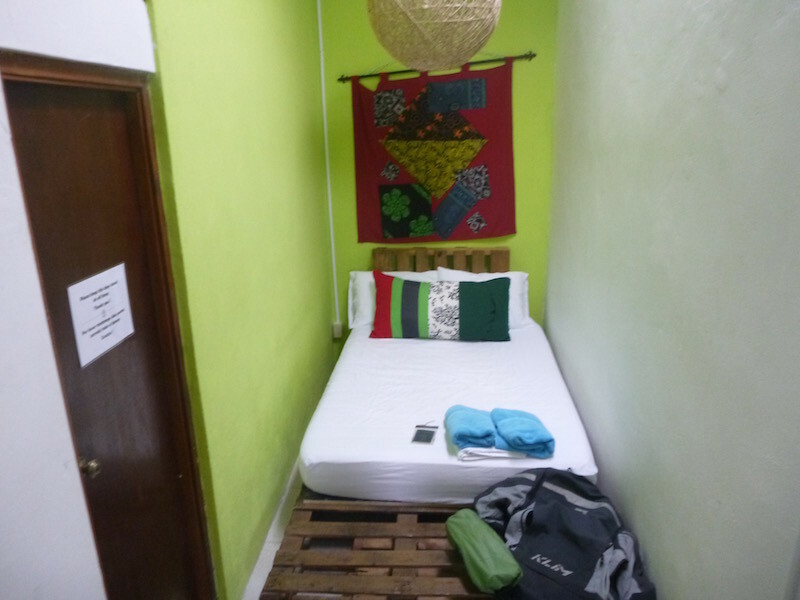 As with most hostels I’ve stayed at, it offers both dormitory and private rooms, some with private baths and some with shared baths. My cabanita overlooking the river. Overlooking the river from my deck. I spent the afternoon adjusting the valves on my bike under the covered patio area while it poured rain. I’m sure I could have gone longer without checking them, and only the intake was slightly loose, but I had the time and figured this was a good place to do it. Couldn’t ask for a nicer place to do some maintenance. 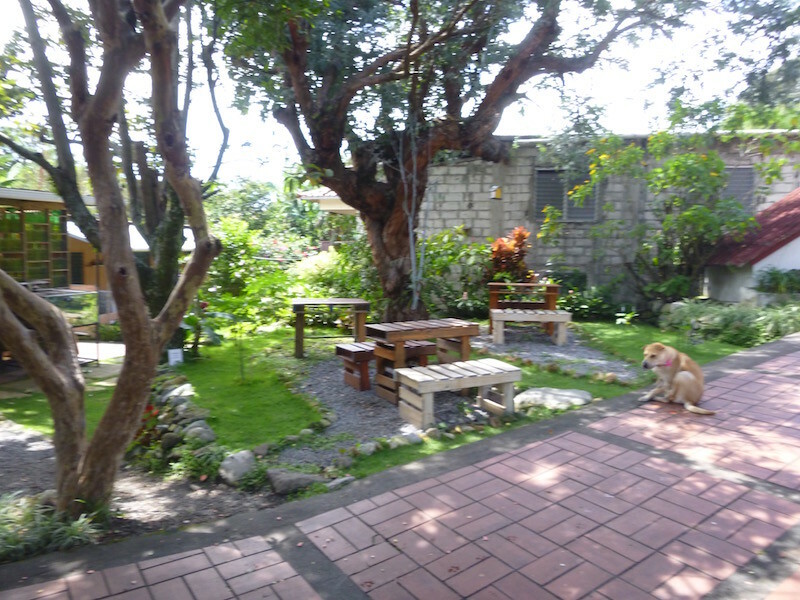 I liked the yard furniture, made from pallets. I could stay here in the cool temperatures for several more days, but I have a few things on my “list” that I want to get done before heading for South America in another 10 days. My brother sent me this link to a great article not long ago. I found myself reading along thinking, “Yes! Exactly! That was me!” It really sums up what was going through my head when I finally pulled the plug and left on this trip. If you’ve ever thought you wanted to do something similar but thought “It will be five years from now before I can do that”, you should really read this article. It’s written by a woman who has been traveling via sailboat for a long time, but regardless of your method of travel, the pieces to the puzzle are still the same. I am sure that to many people who have dedicated their lives to work, this seems like an irresponsible statement. I could go on for a long time about how my view of what’s important has changed tremendously due to the people I’ve met, and the conditions I’ve adjusted to in order to make this trip possible. I don’t miss my big house, all my “toys”, all of the “stuff” I had acquired. Now I look at the simplicity of how houses are built in other places, and how functional and comfortable they can be for a lot less money. I continue to jot down notes about building ideas for whenever this trip is over. I don’t know where that will be, or even when, but there is no question that my lifestyle, views, and most importantly my stress level, have all changed for the better. And I feel like I’m still just getting started. Obvious statement in the title of this post, but today was an example of how using the internet to plan can get you in trouble. Fortunately, I hadn’t made many plans. Last night in Cahuita, Costa Rica, I decided to cross into Panama this morning and try to get to Isla Bastimentos in Bocas del Toro. This requires crossing the border, taking a ferry to Isla Colón, finding a place to store the bike on that island, then arranging a boat to Isla Bastimentos and getting there before dark. I intended to just “wing” most of this. The one thing I had to plan for was the ferry crossing. According to the ferry’s website, they sail twice a day between Almirante and Isla Colón: at 7am and at 12:30pm. It’s about an hour and a half ride from Cahuita to Almirante, and another two hours dealing with border paperwork. So it was clear I wasn’t going to make the 7am ferry. I felt I definitely had a shot at the 12:30pm ferry though, so that was the plan. Judith (from Switzerland) and I teamed up again for the border crossing. This crossing at Sixaola is a very small crossing and an easy one. So easy and slow that there are no “helpers” hanging out here. 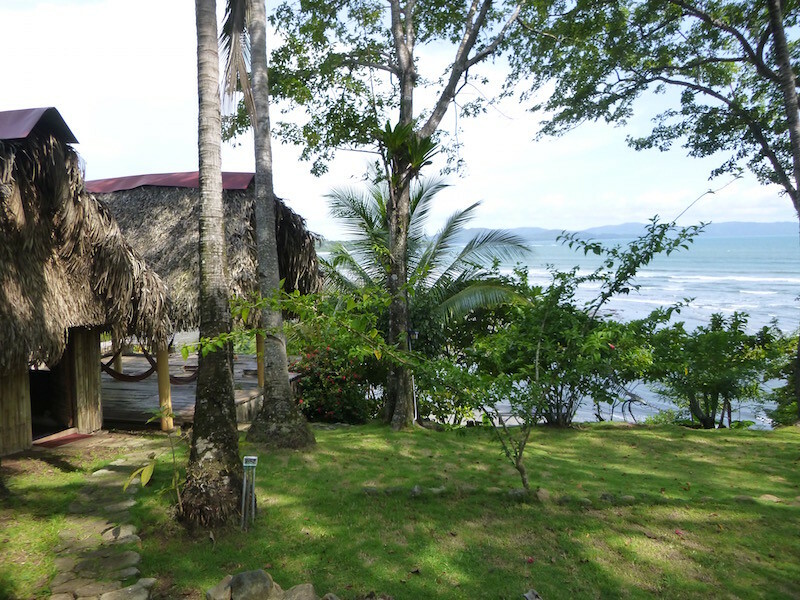 The only problem is there is a regular shuttle service between Costa Rica and Bocas del Toro for the backpacker crowd, and as luck would have it, two shuttles full of Australian backpackers showed up just as we arrived at Immigration. The backpackers don’t have to do the vehicle paperwork, but we all have to go through Immigration first, both leaving Costa Rica and entering Panama. So this slowed us down a bit. Still, it was nice to have one person watching the bikes while the other person did the paperwork. 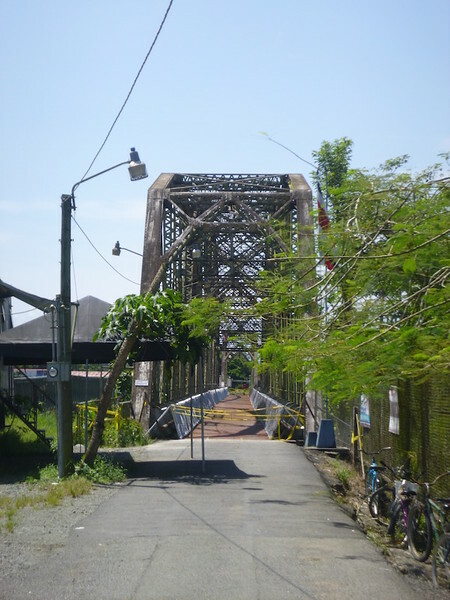 The old “Banana Bridge” at the Costa Rica – Panama border crossing at Sixaola. It’s now been replaced with a new one-lane bridge. Through the border and back on the road. Still looks like we can make it. A few blocks south of the border, the real highway jogs a couple of blocks to the east. My GPS was telling me to go straight ahead, and it showed the road we were on meeting back up with the highway in a couple of miles. So, as usual, I followed the GPS. The two lane paved road turned to gravel. Then it turned to dirt. Then it turned to an overgrown two-track with tall weeds dragging the panniers. 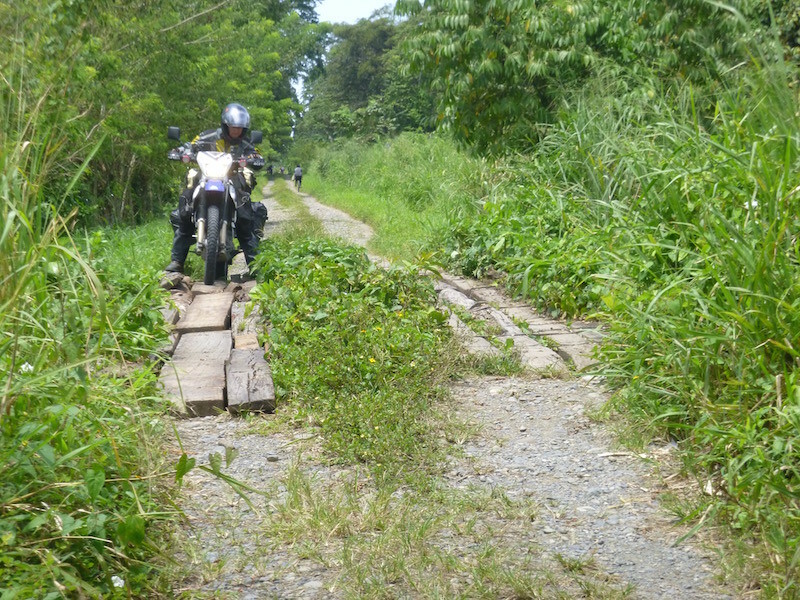 Then came the first wooden bridge, with wood planks on each side for car tires. No problem. Shortly after that, the second wooden bridge: missing a few planks, a few loose boards, but still not bad. Another 300 meters or so, the third bridge: big holes where there used to be planks, very loose boards, no side rails. Things were definitely getting interesting. I was beginning to think this road was going to end before we got to the highway. But sure enough, a mile later, we were back on the main road heading towards Almirante. Just a few kilometers later, we ran into our first military checkpoint. This was the first time in the past two months that I was stopped and asked for paperwork. First, my driver’s license. Then my passport. Then the vehicle import papers. Then my vehicle title. Crickets. Total silence. Not even a hint of a smile. Hmmmm. Okay. I’ll just keep my mouth shut rather than offer a snappy retort about how beautiful my country is also. Of course everything checked out fine and we were free to go. According to the GPS, it looked like I might make it to the 12:30 ferry by a few minutes after noon. That should give me time to buy a ticket and get the bike on board. Pulling into Almirante, it was clear this was not a luxury resort by the sea. This was a shipping port. Scrappy, dirty, with no hotels, restaurants, or other amenities for the tourist. I pulled up to the ferry. No cars. No tourists. No one else going to Isla Colón. A couple of workers looked back at me. I looked at the sign painted on the back of the ferry: “Almirante – Isla Colón, Tuesday – Sunday, 7am”. Not a mention of a 12:30pm ferry. Because there isn’t one. Regardless of what their website says, there is only one ferry a day, and it was five hours before I got there. I was very thankful that I had decided to “wing it” and not book a hotel on the island for tonight. I pondered my options. I could try to find some place to stay in Almirante, though it didn’t have a nice, safe vibe to it. I could go somewhere else and come back in the morning, but I couldn’t go far because the ferry leaves at 7am. I finally decided that I was going to spend three days in the San Blas islands in two weeks, so there was no real need to spend all of the time, money and effort required to get to Isla Bastimentos. Looking at the map, I was still a few hours away from Boquete, but there wasn’t much between here and there, and I knew Boquete was in the highlands and would be cool and a good place to relax for a few days. So on I went. The road between Almirante and Boquete is a bit rough with potholes and sections that have been repaired with gravel but not yet paved. 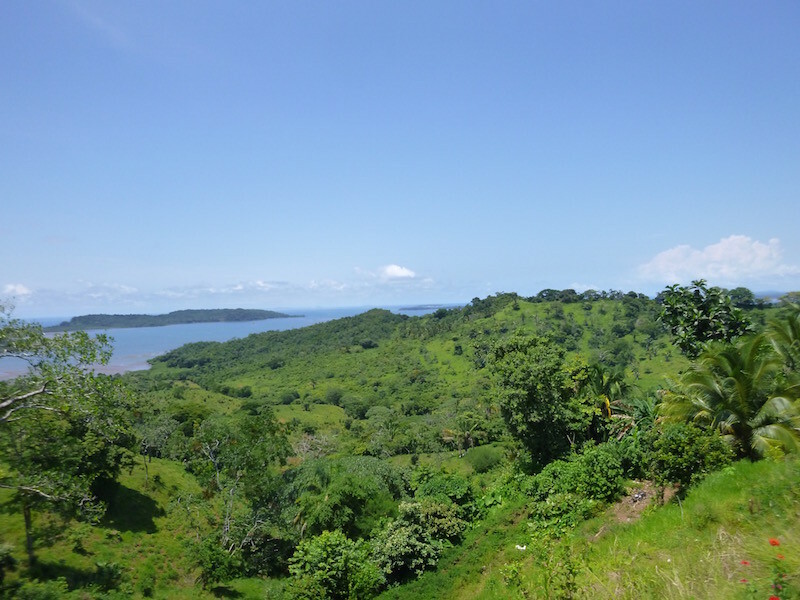 But the scenery is great, including views of the Caribbean and multiple waterfalls as you climb higher. Climbing into the hills just after the rains. Low clouds, lots of green. 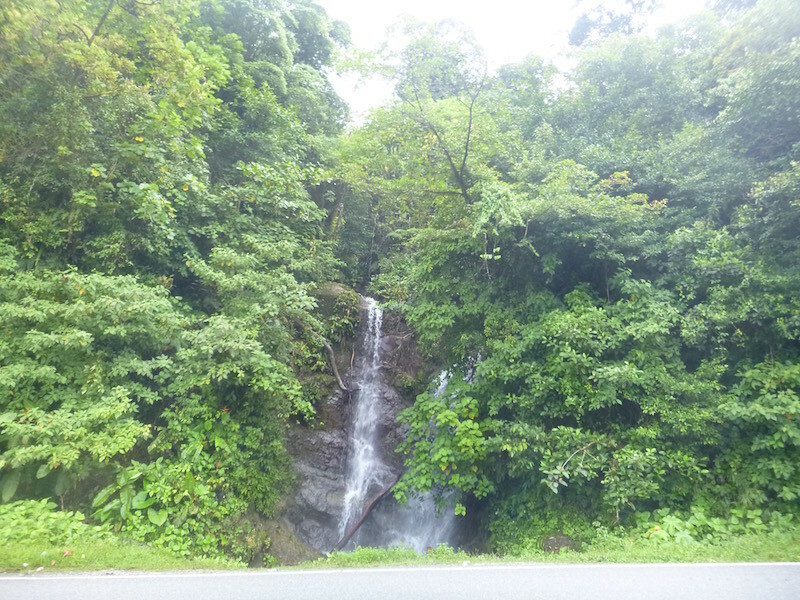 Lots of these waterfalls along the road. Just past El Letrero I turned off of Highway 10 onto a small side road that looked like a shortcut over to the David-Boquete highway. This turned out to be a great road, with beautiful views and several bridges over a nice river. It had rained very recently and the clouds were low on the hills. 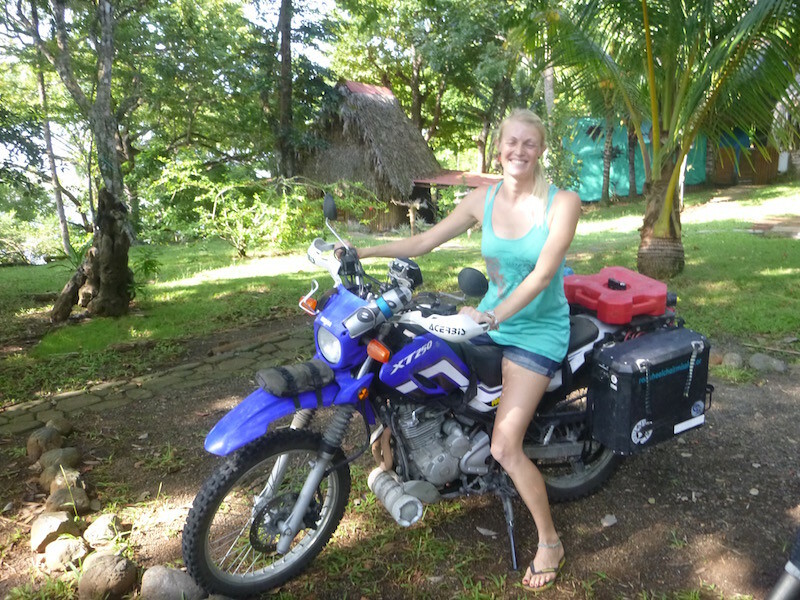 Pulling into Boquete I ran into the same two Canadians on KLR650s that I had met on the ferry to Ometepe. It sounds like they might be on the same boat to Colombia that I’m booked on. The temperatures here are in the 60s at night and 70s in the daytime. I’m nearly a week ahead of schedule. So I’m planning to enjoy the cool weather, change the oil and adjust the valves on the bike, give it a wash and get ready for Panama (City). 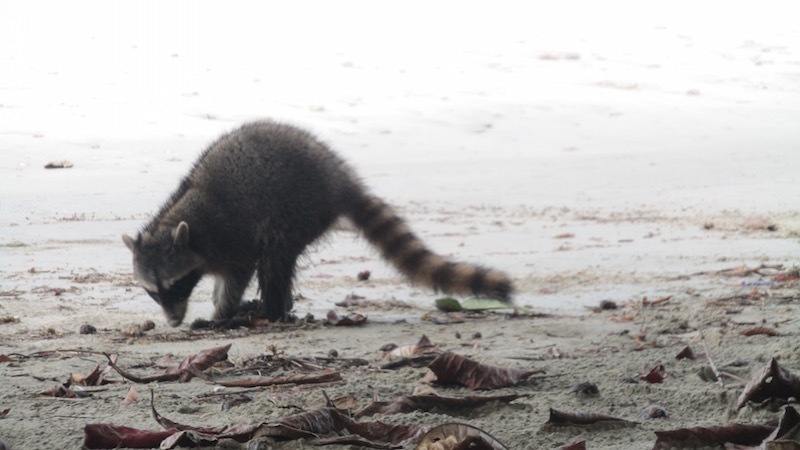 Just south of the major port city of Limon, Costa Rica, and just north of the Panama border is the sleepy Caribbean village of Cahuita. All along this coast you can see, hear, and feel the Caribbean influence. The people here are more Jamaican than Hispanic. 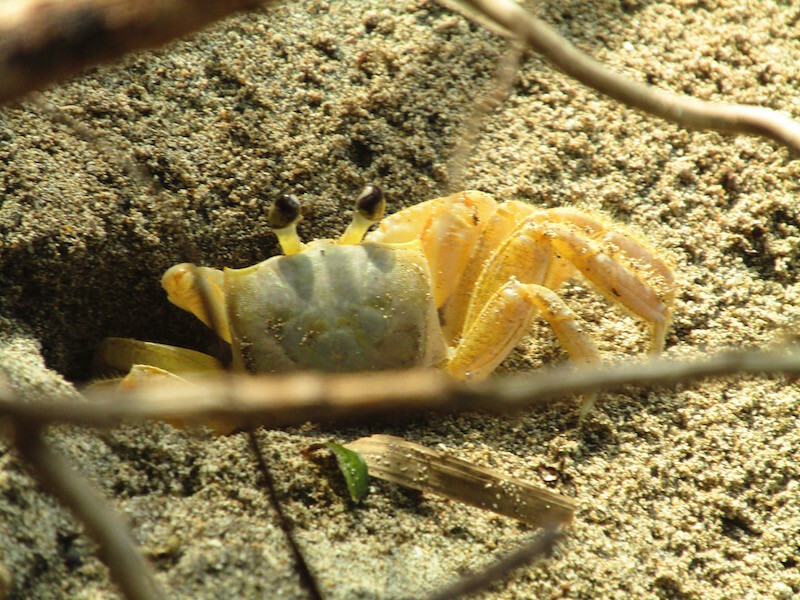 They tend to speak Spanish but otherwise the place feels more like the other side of the Caribbean. And of course there is Reggae music and Bob Marley posters everywhere. 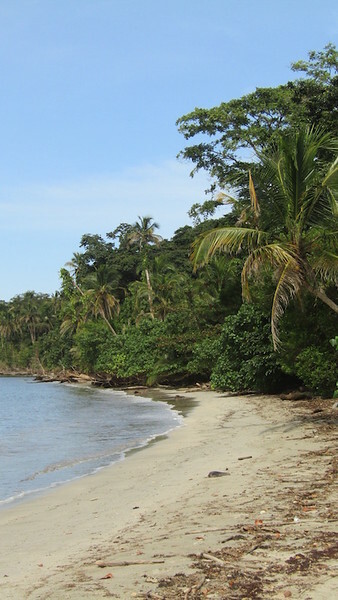 The Cahuita National Park is a 2700 acre preserve on a peninsula. It is mostly dense jungle, with some wetlands and a couple of rivers. It also includes a 600 acre coral reef. 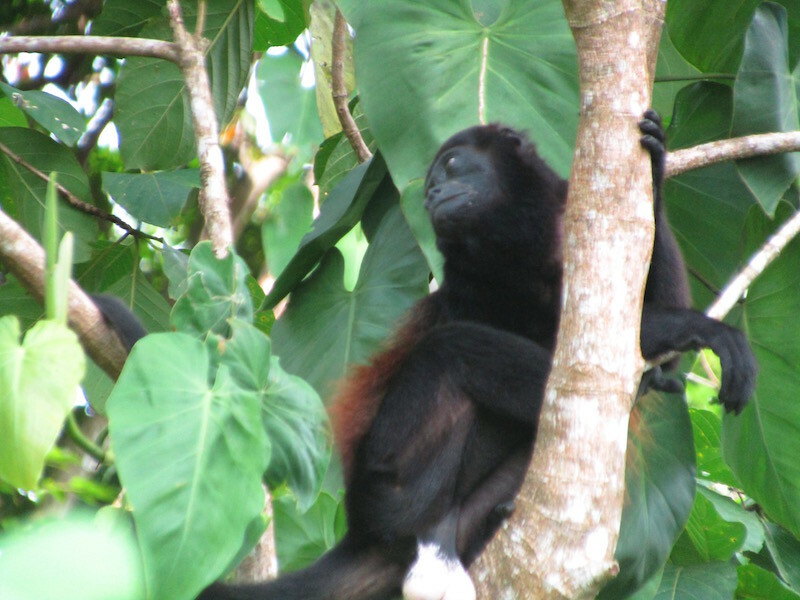 It is also the only National Park in Costa Rica that does not charge an admission fee. 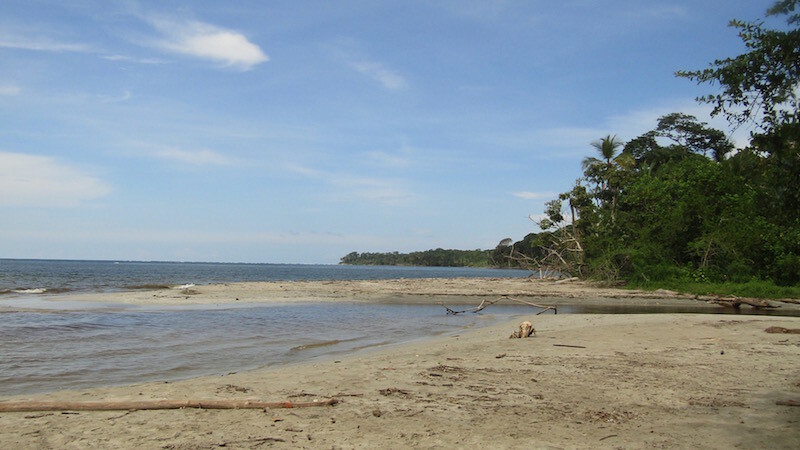 The beach inside Cahuita National Park. The jungle comes right down to the beach. At one point you have to wade across this small river to continue up the trail. Caimans live here — somewhat smaller cousins of the alligator. Despite the snake education I received a couple of days ago in El Castillo, I walked from the hostel into the village and then down the trail through the jungle alongside the beach this morning. I was captivated by all of the wildlife. 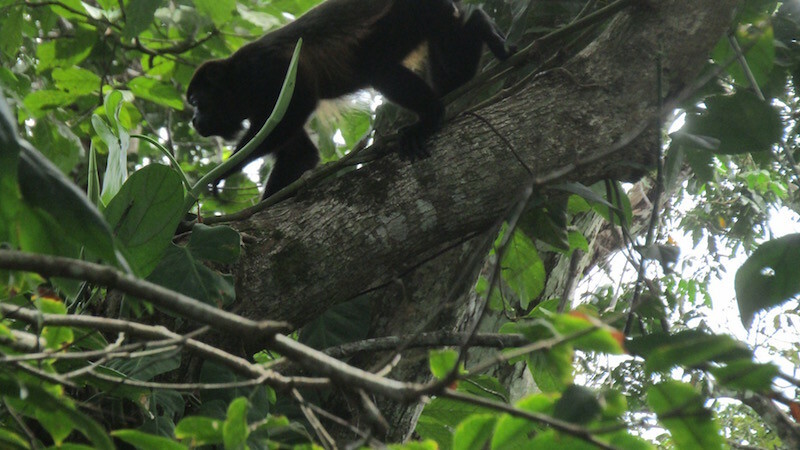 It only takes standing still for a few moments to see something new moving in the jungle. Love this shack on the beach on the way to the park. 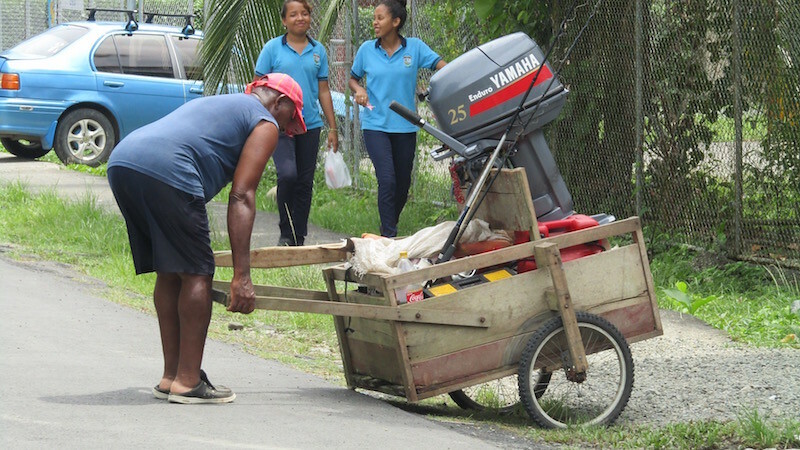 On the way through Cahuita, this fisherman was returning home for the day, with his supplies from his boat, including the motor, in his cart. 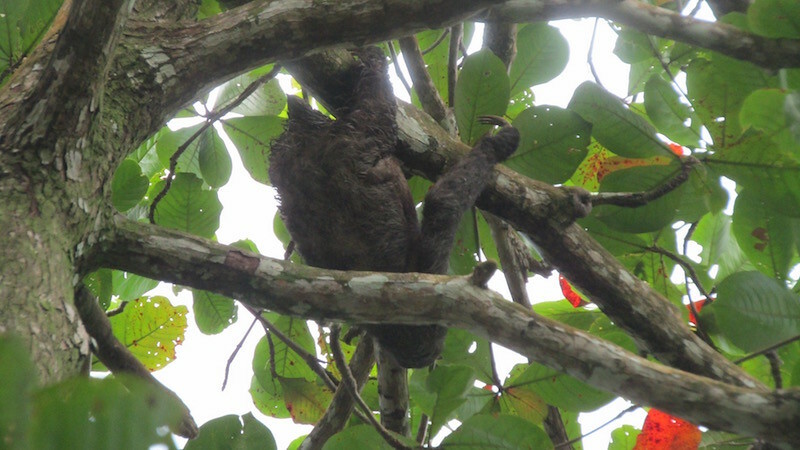 Three-toed sloth, moving very slowly through the trees. 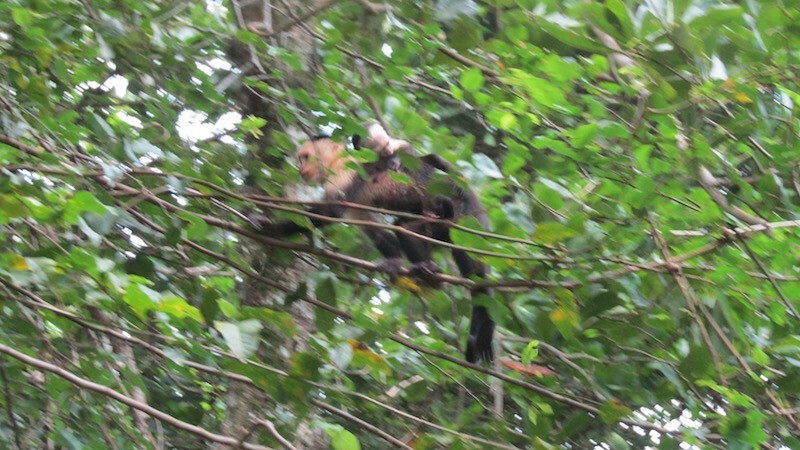 White faced Capuchin monkey with baby on her back. 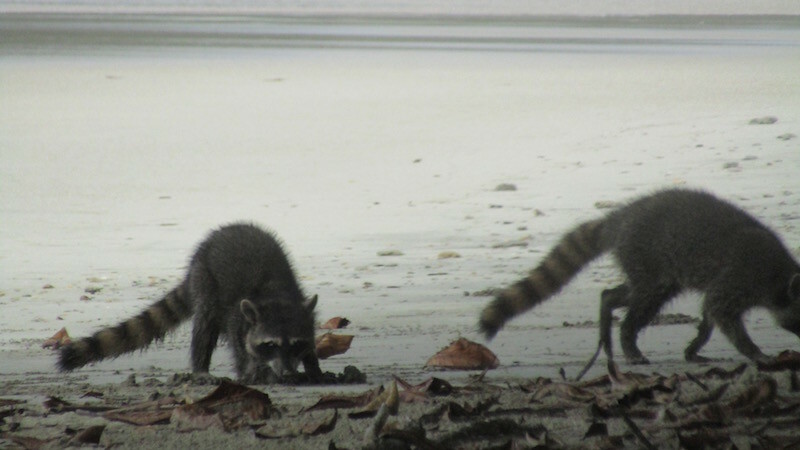 These guys were hunting crabs on the beach. 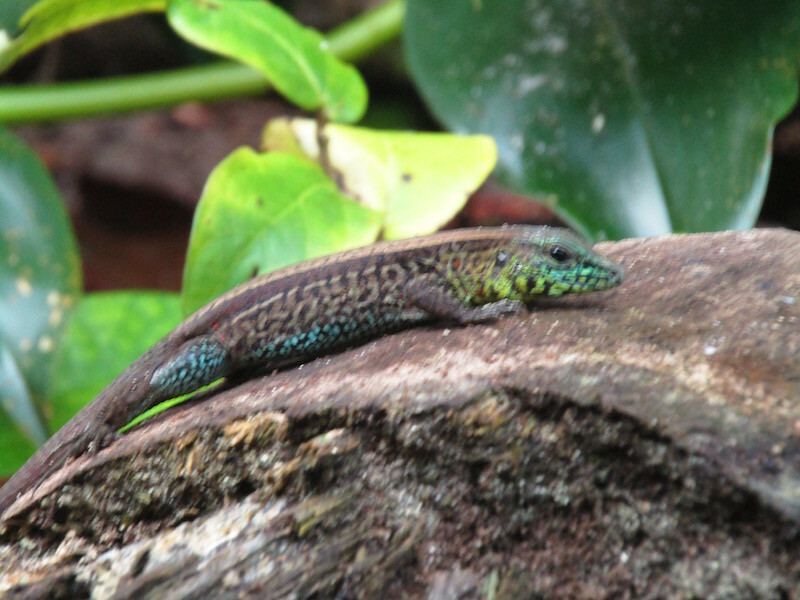 These lizards were everywhere. They would walk down the trail in front of me like a dog on a leash. 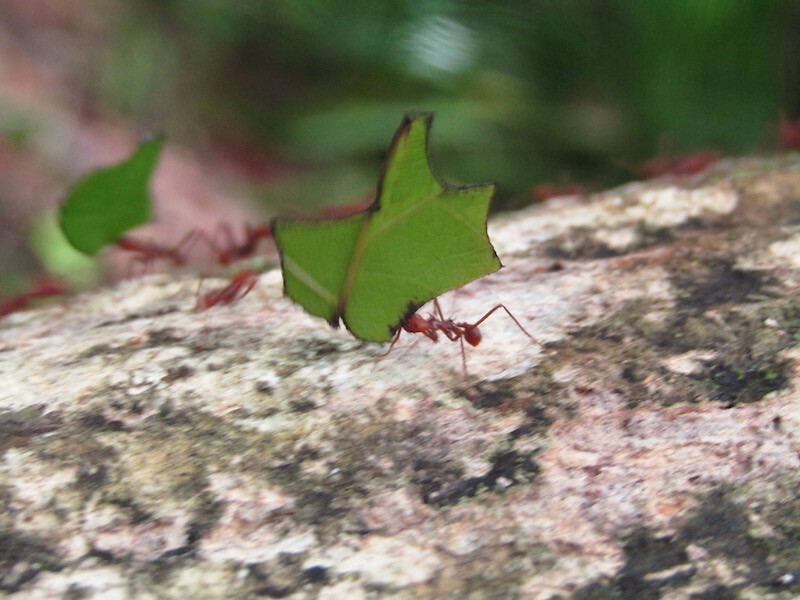 Leaf cutter ants. It was fun to watch the long trails of leaves walking through the forest. 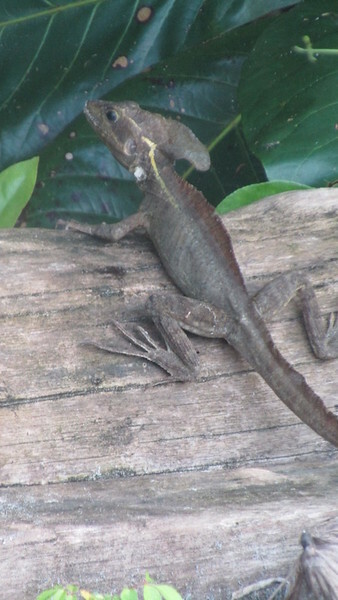 A Basiliicus, also commonly called a Jesus lizard. These guys can run really fast on their back legs, across water. 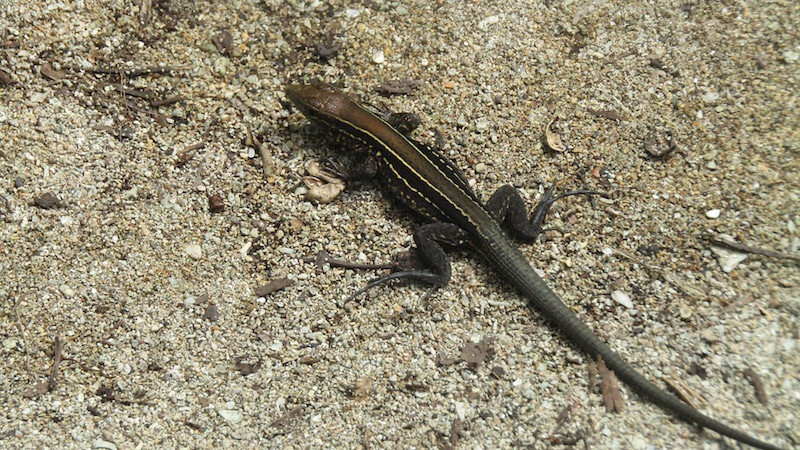 This guy was about four feet long, including his tail. 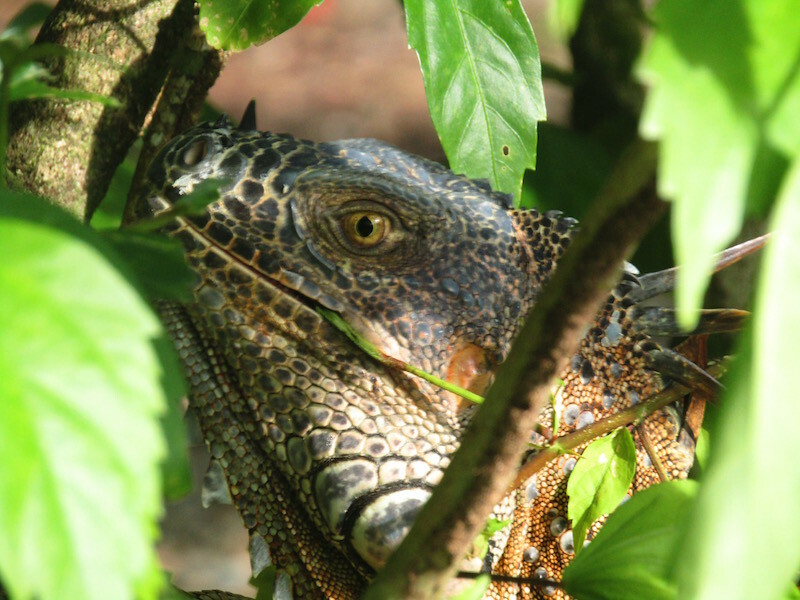 He was calmly sitting in a plant, eating. Check out the spikes on his back. It’s still hard to grasp sometimes. Another day of rain. It is rainy season here, after all. This being the third straight day of rain, I decided to change my plan. I had originally intended to head west to the Nicoya Peninsula, as there is a small dirt road/trail that I’d heard about that I really wanted to ride. Unfortunately I had also read that the Nicoya Peninsula can become impassable during September and October due to heavy rains. It seemed like a waste to ride all the way over there just to find out I couldn’t do the 60 miles I really wanted to do. 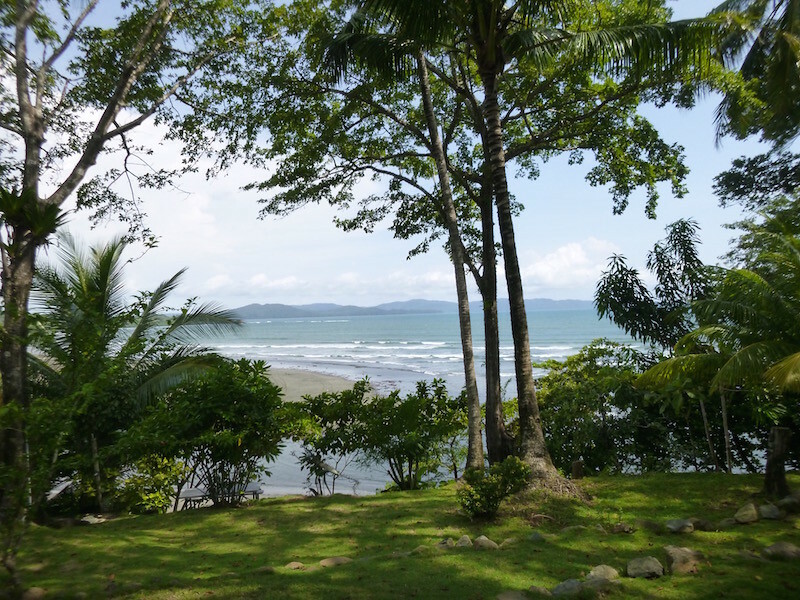 So, instead, I heard that the Caribbean coast was much drier and had some good snorkeling reefs around Cahuita, which is about 30 miles north of the Panama border. I spent another couple of hours riding in the rain, but eventually broke out into nice weather. And the weather was the best I could say about most of today’s ride. It turns out Highway 32, or Ruta 32 as it’s called here, is the main highway to and from the huge shipping port of Limon. The road is only two lanes, and winds up and down hills and through small villages. This creates some very long bottlenecks of 18-wheelers heading to and from the port. 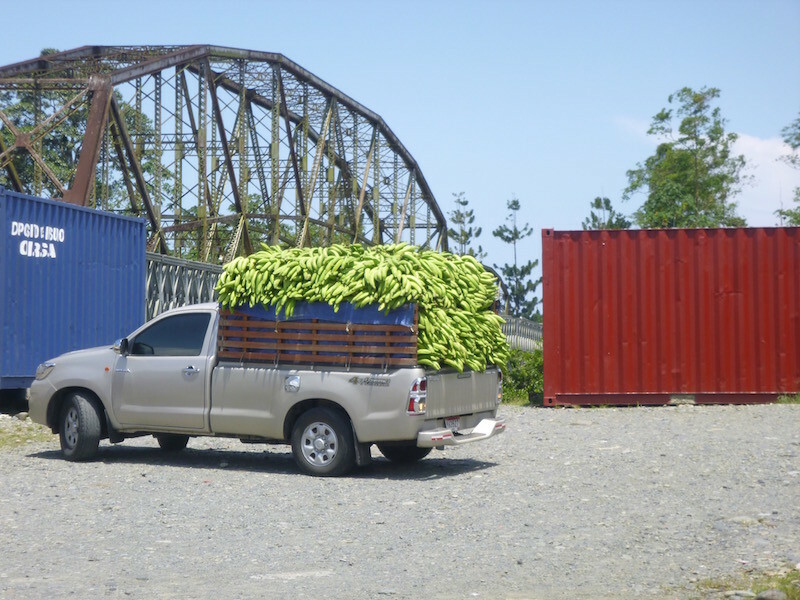 There are huge banana plantations all around this area, mostly operated by Del Monte and Chiquita, and this adds to the truck traffic as well. 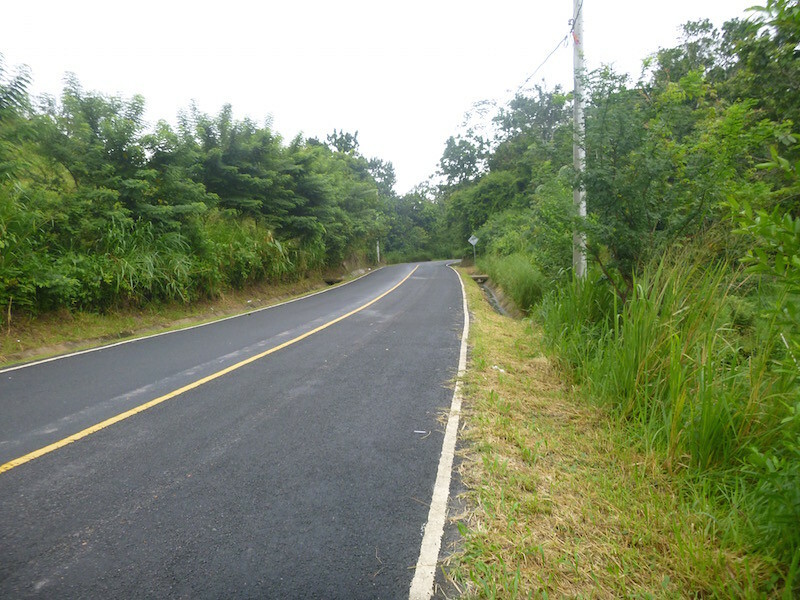 I had to think for a while, but I’m fairly certain that Ruta 32 in Costa Rica is the first road I have ridden on this trip that I would recommend people NOT take. So as not to infect my next very positive post with this negative one. I’ll stop whining here. 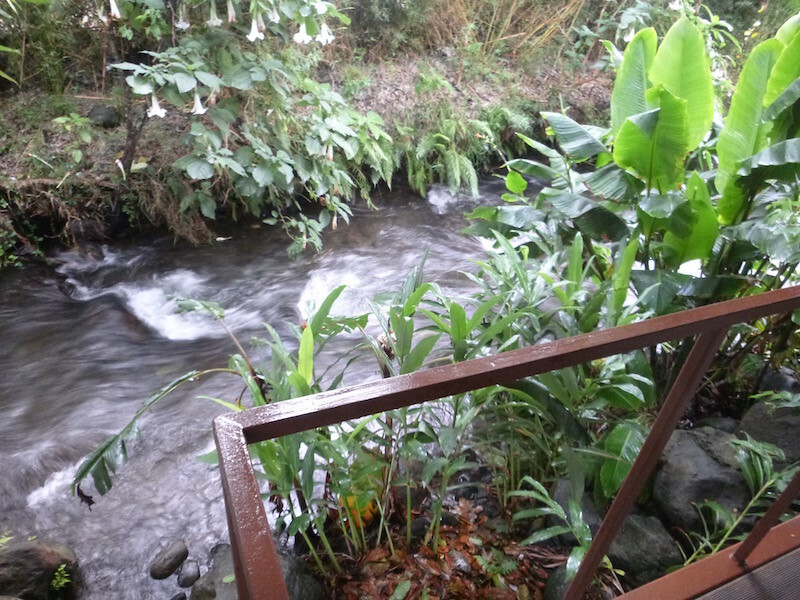 Costa Rica: Is It Finally Really Rainy Season?? 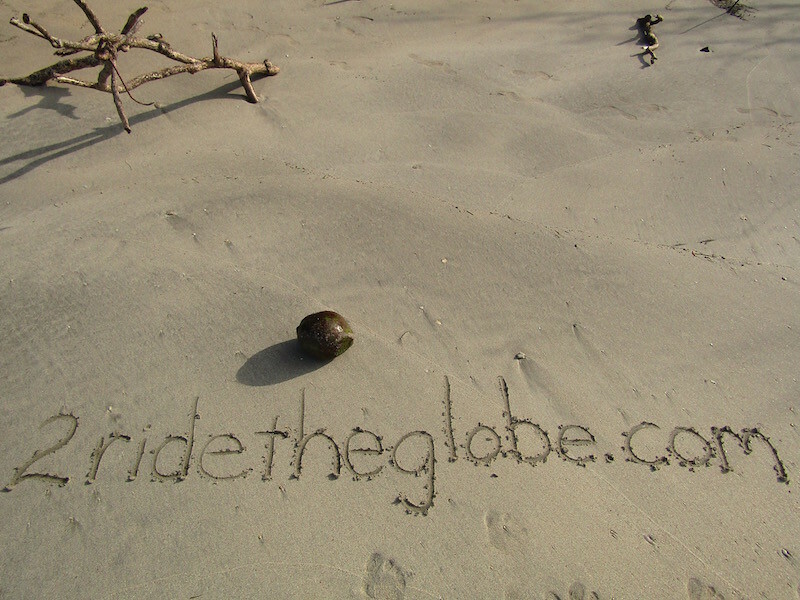 From Playa Maderas, it was only about an hour to the Costa Rica border crossing. The border crossing was a relatively straightforward affair, aside from the rain and a certain customs official who was apparently having a bad day. Total time spent at both the Nicaraguan and Costa Rican immigration and customs offices: approximately two and half to three hours. With all of the rain, I’ve been taking very few photos. 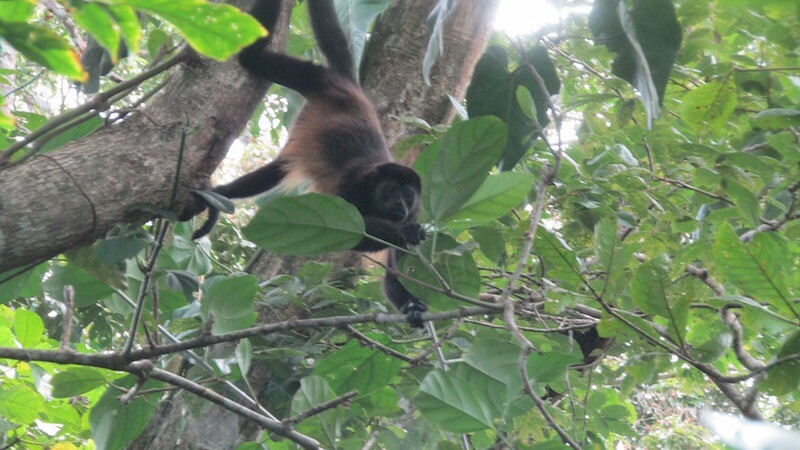 Not far from the border in Costa Rica is Santa Rosa National Park. Once again, the plan was to camp here, and try to amortize my lodging budget. The sign at the entrance to the park said the entry fee was $10 and the camping fee was another $2. That put it well within my budget. But better yet, it’s the off-season and mid-week here, so there was nobody present and no way to pay the fees. I figured perhaps on the way out in the morning I would meet the park ranger and pay, but again there was nobody, aside from one couple camping and a classroom of grade school students and their teacher that showed up early in the morning. How does a frog that large hide under the rim of the toilet bowl until you flush it? It rained a bit during the night so I had to put the rain fly on the tent, making it a bit more humid. By morning it had stopped and cooled off a bit, but remained very cloudy. After breakfast and packing up, I headed towards Lake Arenal and Volcan Arenal. Highway 142 goes around the east side of the lake, and provides some great views and a fun ride. Lake Arenal, Costa Rica. The low clouds and rain prevented a clear view of Volcano Arenal, but even the rain couldn’t keep me from smiling at the great road and scenery. The abundance of ex-pats is obvious as all of the signs are in english, from real estate signs to store signs. Unfortunately, the rain continued and the clouds stayed just above the lake, shrouding the volcano and making photos difficult. 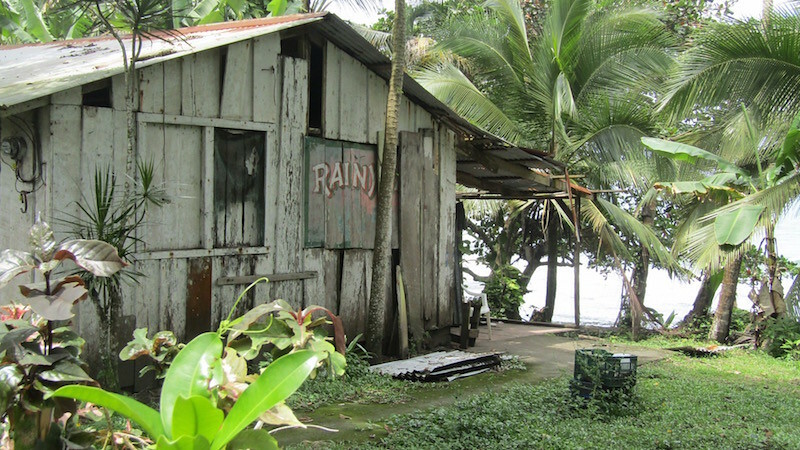 The rain stopped for about ten minutes in Nuevo Arenal, so I decided to stop for groceries. Just coming into town I met another loaded bike heading in the opposite direction. 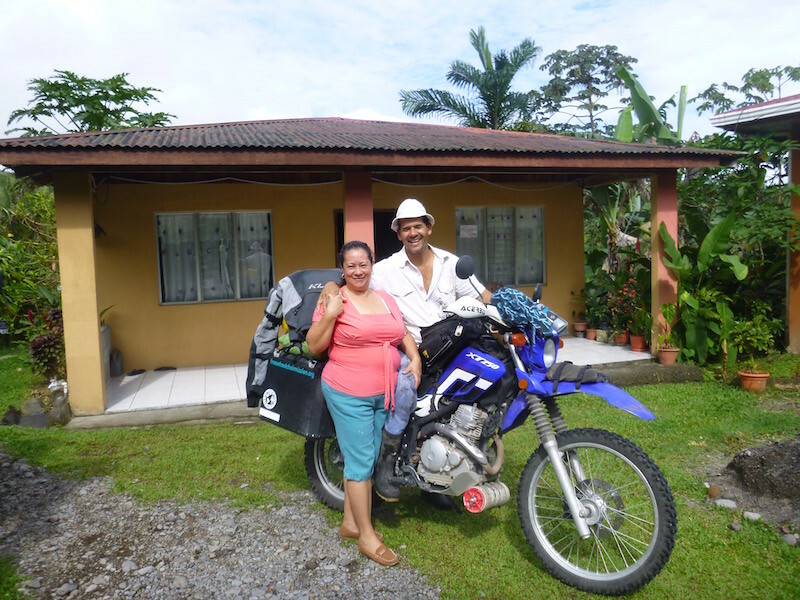 Ignacio, from Chile, has been traveling for a year on his Suzuki DR650, and is headed to Alaska. While in town for just a few minutes, I also met a Canadian who has lived here for ten years, another gentleman from Europe who clearly has been here quite a while, and a couple from North Carolina who spend six months a year here and mentioned they have several neighbors here from Texas. The area around the lake is gorgeous. I can understand why so many people would move here. Just past the dam at the entrance to the Volcan Arenal National Park the road splits. The road along the other side of the lake is dirt. Fortunately it’s fairly well maintained, so the rain wasn’t too much of a problem. A little further down the dirt road is the small village of El Castillo. It was getting late, so I stopped at Cabinas Orquidias for the night. 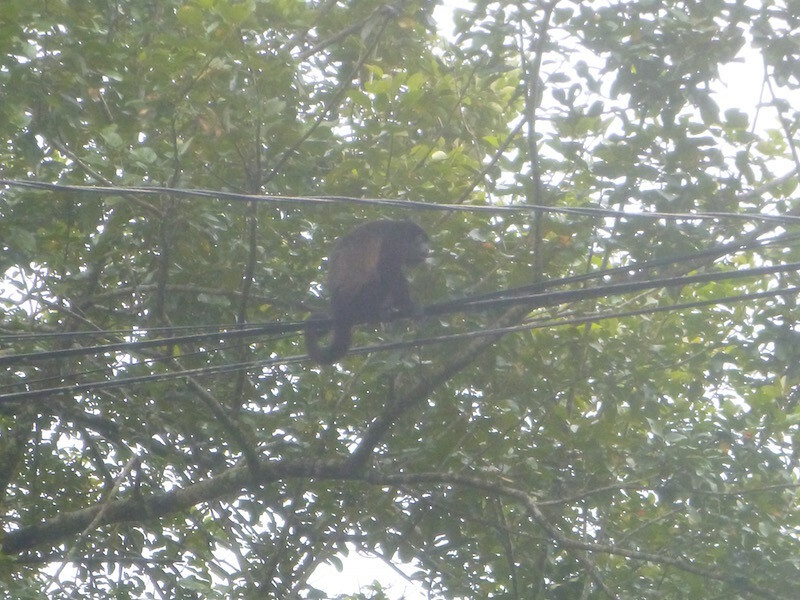 On the way up the hill to El Castillo I had to stop and gawk at the dozens of howler monkeys in a few trees at one turn on the road. 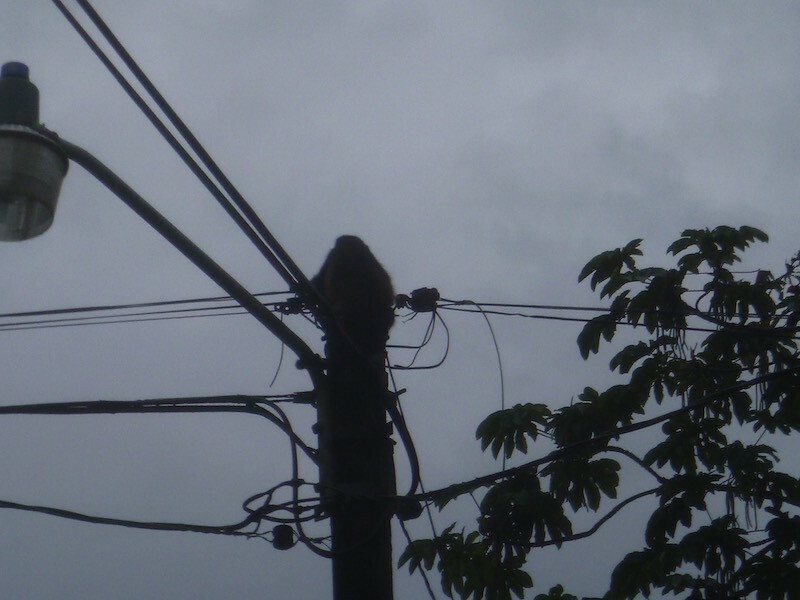 Bad photo, but that is a howler monkey sitting on top of the utility pole. The family at Cabinas Orquidias was incredibly nice. Besides renting me a beautiful, brand new one bedroom house with covered carport and one of the nicest bathrooms I’ve seen in a month for $30, they brought me a coffee maker and coffee from their house, offered me bread and even offered to let me come use their computer in their house since they didn’t have wi-fi in the rental yet. I politely declined. Sometimes the lack of internet access can be a very peaceful thing. The kids were in school when I left in the morning, but Mom and Dad were happy to pose for me before heading out. This place is worth the stop, and I would recommend a couple of days here to explore the area. So much to see. In the one-street town of El Castillo is the Eco-Zoo, which is really more of a snake farm with frogs and turtles and a few other local critters thrown in. I probably should have passed, but the hour long tour was extremely informative and will no doubt make it hard to camp from now on. Or at least I’ll think twice before stepping out of the tent in the dark. 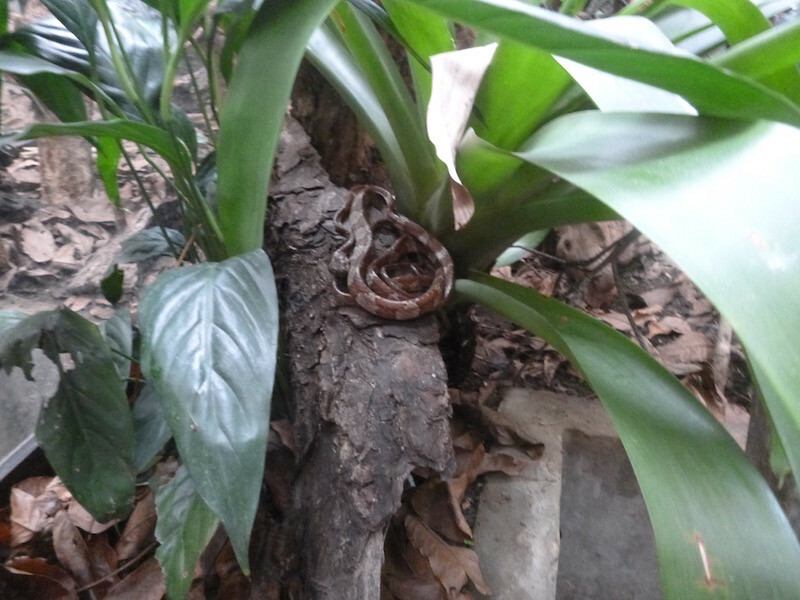 I can’t remember the names of all the different snakes I saw at the eco-zoo in El Castillo. About half of them were venemous, and some were very large. This was one of the smaller examples. Much larger examples. 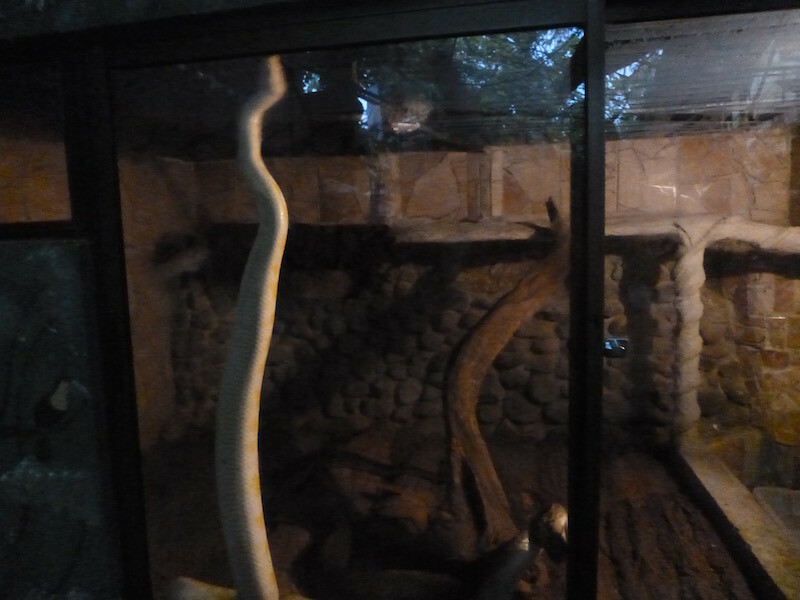 The albino python on the left was climbing up the window. The other python in the lower right is actually larger than the albino. These two were huge. 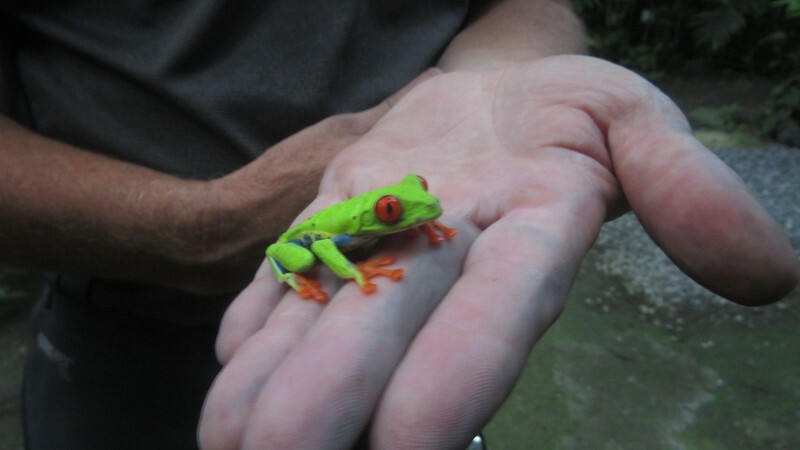 We were allowed to hold these red-eyed tree frogs. 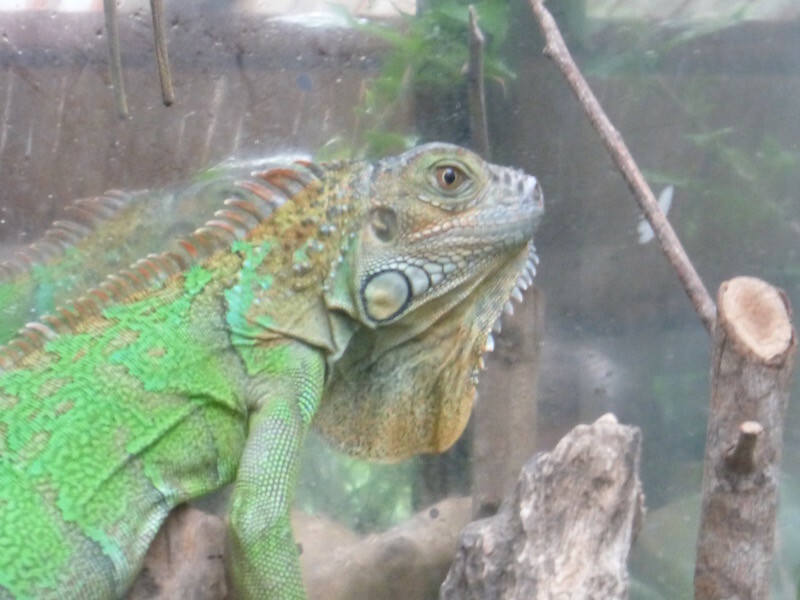 Large selection of lizards at the zoo also. 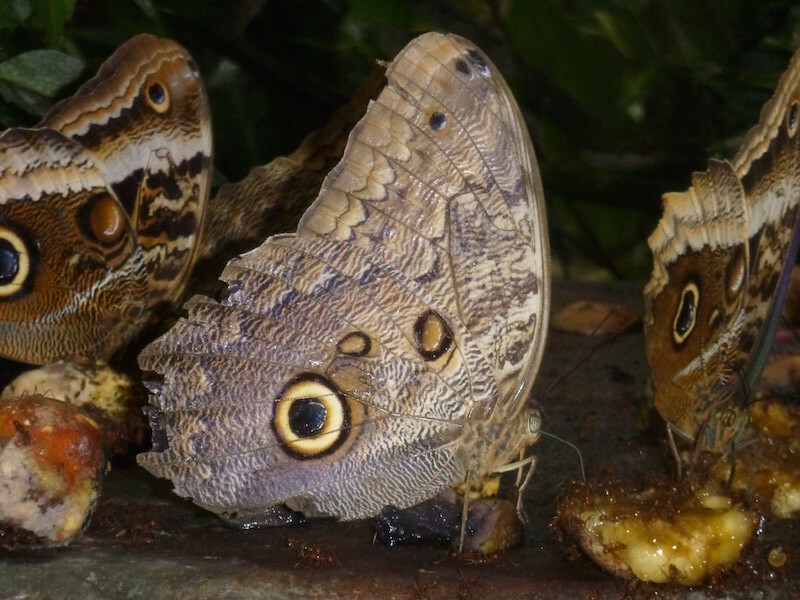 These are the biggest butterflies I’ve ever seen. Just huge. 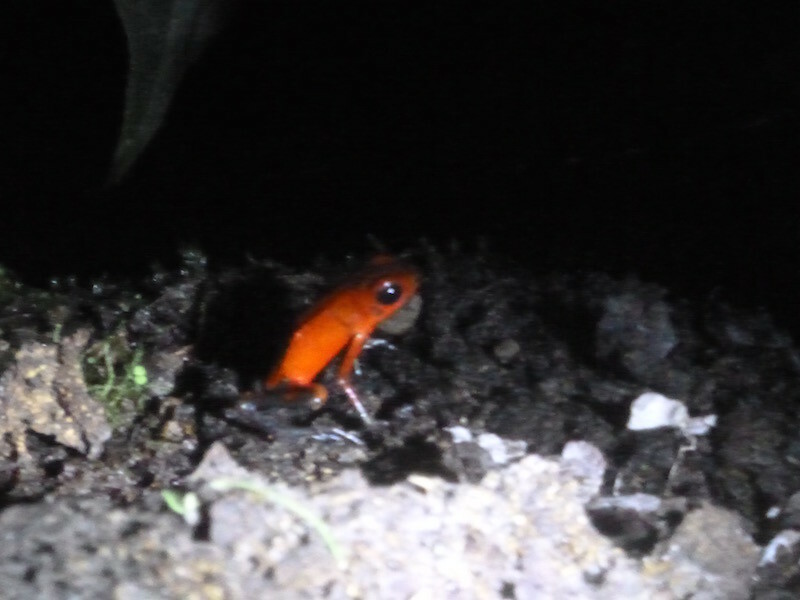 Blue jeans poison dart frog. Very small. Very cool looking. Of course it was raining the entire time I was looking at the critters. I think maybe I finally found the rain in Central America’s rainy season. 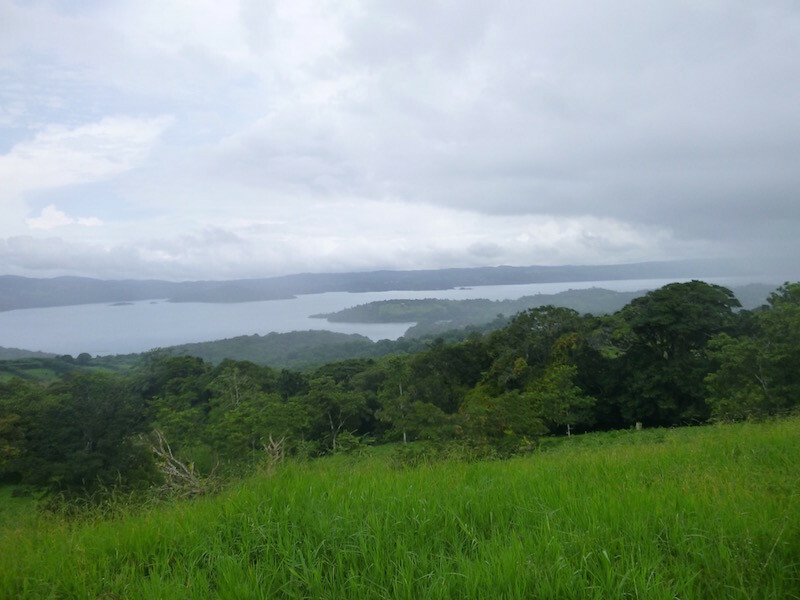 They’ve been in drought conditions, but around Lake Arenal, it seems to be less so. This was day two of real rain.